Kalsang is a two floored restaurant hidden from common view, with a very small seating area. The interiors are beautifully decorated with chinese lanterns and the theme is that of the Chinese red. Though the seating is a bit cramped, that does not deter the thousands of tourists who pour in daily to get a taste of their delightful food. It provides a wide variety of Tibetan, Chinese and a few Japanese dishes. The Chicken Chinese Mushroom Soup served here is a glorified version of Thukpa. 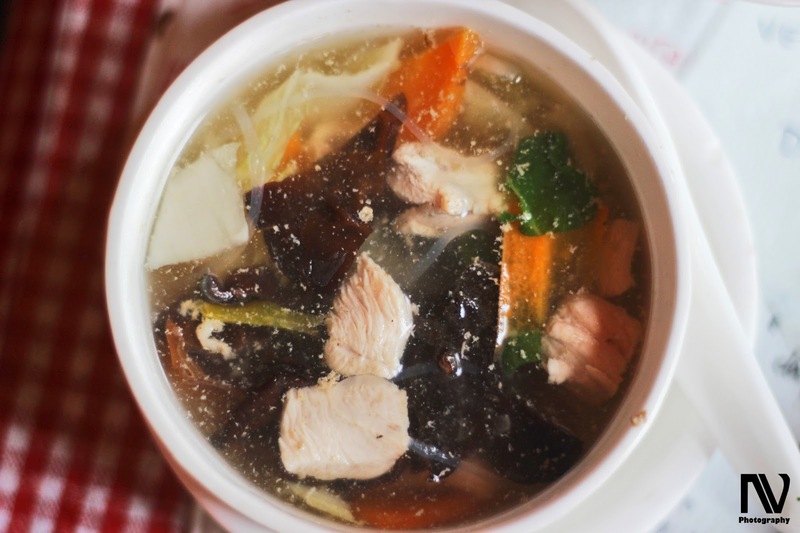 It is a clear soup with lettuce, black mushrooms, capsicum, and rice noodles boiled with chicken stock. This is a treat for all the calorie conscious people as it can form a meal by itself and adds very little to the waists. The chicken was boiled to perfection; it was so soft and tasty that you can't get enough of it. The mushrooms, lettuce, capsicum very not entirely boiled and provided the crunch to the otherwise mushy soup. The taste was not extremely overwhelming but wasn't too blunt either. The most famous dish here is the Devil Momos. The Chicken Devil Momos, topped with cheese was simply breath-taking. 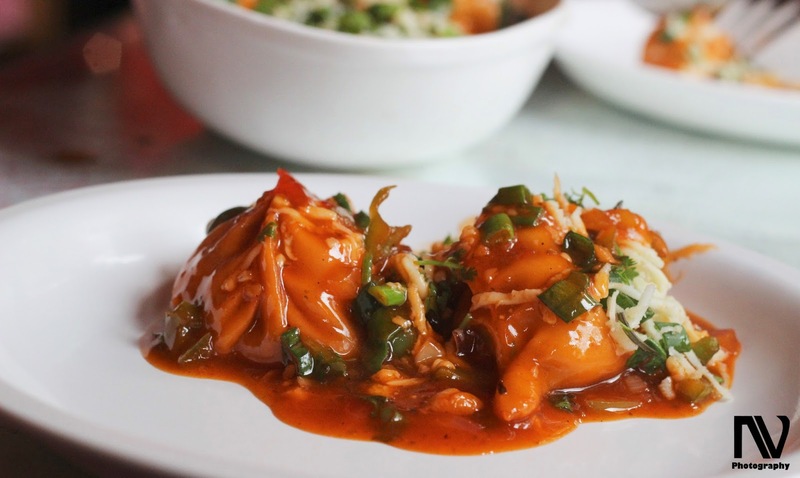 Momos were sauteed in a garlic sauce with onions, capsicum and green onions, with a cheddar cheese topping. 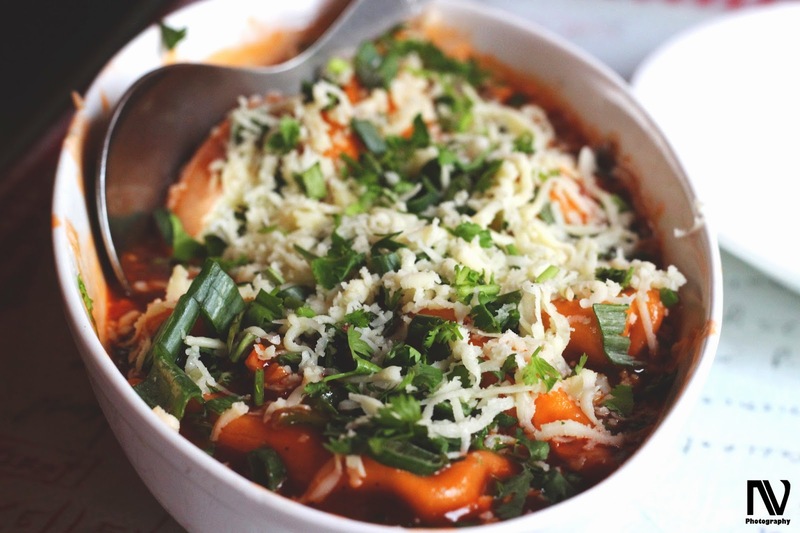 It had a subtle taste of garlic with a hint of sweetness, which made this combo perfect with contrasting flavours. Yakitori, a Japanese version of grilled chicken skewers is another dish famous in this restaurant. Though the term ' yakitori ' refers to skewered food in general, it is chicken that is served in this restaurant. It is made with several bite-sized pieces of chicken meat, mounted on a bamboo skewer and grilled. It had a sweet flavour with soy sauce taste in the background. The chicken was tender and had a nice crisp coating, served alongside crunchy semi-cooked vegetables. The secret behind Kalsang's superior ranking is that the restaurant emphasises on the quality of the food while charging a reasonable amount for the dishes. 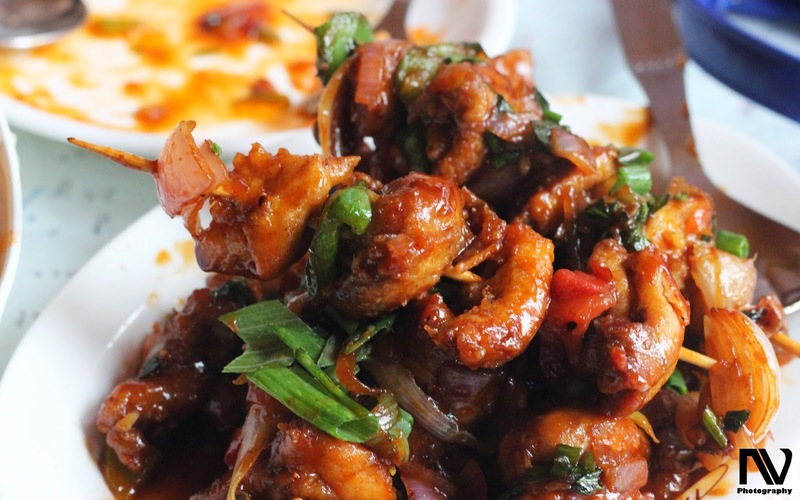 A helpful staff, fast service and good quality of food allows them to be deservedly one of the best restaurants of the hill station. Brief but well written and with beautiful pictures! Thank you Sunil, Kalsang is a hidden gem in Mussoorie, serving great Tibetan food. Thanks magiceye, the pictures were the handiwork of the Team Foodaholix photographer Naman Varshney. mouth watering snaps and lovely post. Thanks Rakesh, you must try Kalsang the next time you go to Mussoorie. How was your experience like Kokila? Do share with us. Yes, it is not exactly a fine-dine place but serve some of the best and tastiest dishes in Mussoorie.